Near the end of the 80's I served in the Swedish Army for the last time. Being a non-com in the Signal Corps I was called up at regular intervals to serve a few weeks. On one such occasion I was just killing time in the reading room at the base and ran across a copy of an East German army magazine - Armee Rundschau (4/1985, p.21). It had an article about the KAL-007 downing in September 1983. 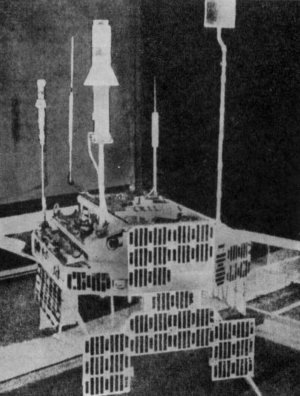 The Soviet version of events was that the overflight of the airliner was co-ordinated with passes of a "Ferret" satellite. 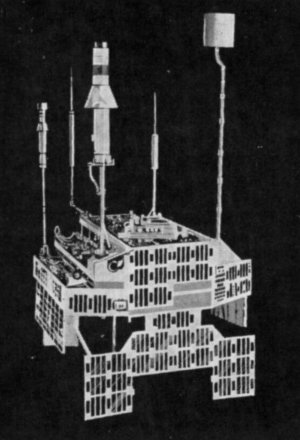 This version was repeated in the East German magazine, but also illustrated with a picture of a satellite! I was really startled and grabbed the magazine and rushed to the admin building and convinced a secretary that I needed to make a Xerox copy. The picture on the right is from this Xerox copy. What kind of satellite is it? It sure has plenty of funny looking antennas so it makes sense that it is an ELINT satellite. Initially I thought it was an early NOSS spacecraft. After I had posted this question on several list servers I had a torrent of replies identifying the satellite as the P-11 ELINT subsatellite developed by Lockheed. From Olaf Bieler I received two more pictures (see below), which seem to be the originals of the picture above. The first (on the left) was published in the magazine "Astronomie und Raumfahrt" issue #1/1973 and is titled in German: "Ein Funkspionagesatellit P-11 der US-Air Force" (An ELINT satellite of the USAF). The picture on the right with blacked out background is from the book "Raumflugkörper - Ein Typenbuch", published by the East German "Transpress" publishing house in 1975. The title of the picture is simply "P.11". 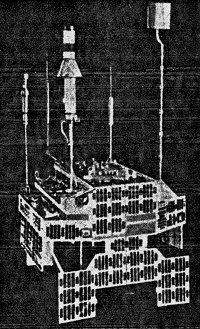 The P-11 satellite is described in this book as a ELINT with nick name "Ferret" with 1st launch on 15.05.1962. 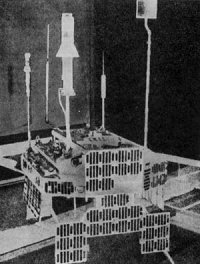 The launch referred to is Catalogue number 00292, 62-18A, Discoverer 41 (FTV 1126), which entered an orbit with i = 82.3 deg, T = 94.0 min, h = 305-634 km after having been launch at 1941 UT. However, I have not been able to find any reference to the P-11 subsatellite in relation to this launch - in any of the rather extensive databases that I have access to. At Charles Vick's ELINT Sub-Satellites on the Global Security Website the satellite in the pictures above is clearly identified as "First generation Lockheed Sigint., spin stabilized" weighing 800 lbs. i.e. 362 kg. Several of the other SIGINT craft in the same sketch by Vick have the same antenna arrangement!